Update: The event has reached capacity. A live stream of the event can be viewed by clicking here. Join the Texas Tribune for a discussion on the health care agenda heading into the 86th legislative session. Our panelists are: state Rep. César Blanco, D-El Paso; state Rep. Mary González, D-Clint; state Rep. Joe Moody, D-El Paso; state Rep. Lina Ortega, D-El Paso; state Rep. Joe Pickett, D-El Paso; and state Sen. José Rodríguez, D-El Paso. Evan Smith, CEO and co-founder of The Texas Tribune, will moderate this event. 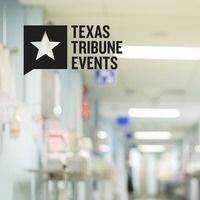 This series of conversations on health care is presented by Blue Cross and Blue Shield of Texas and is supported by Quest Diagnostics, the Law Office of Carlos Eduardo Cardenas, P.C. CityHealth, the Hospitals of Providence and Meadows Mental Health Policy Institute / Hackett Center. It is hosted by The University of Texas at El Paso. Union Building East, Tomas Rivera Conference Center, Rm. 308 351 W. University Ave.